Home Did you know? Difference American Staffordshire Terrier and the Staffordshire Bull Terrier ? Difference American Staffordshire Terrier and the Staffordshire Bull Terrier ? What’s the Difference Between the American Staffordshire Terrier and the Staffordshire Bull Terrier? Know your dogs! Frequently confused breeds. Get the low down on the differences between these similar-looking dogs. 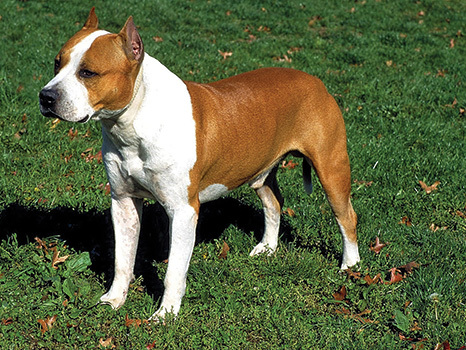 Courageous and strong, the American Staffordshire Terrier, aka the Am Staff, has an athletic build and intelligence that make him ideally suited to dog sports. He is often identified by his stocky body and strong, powerful head. This people-oriented dog thrives when he is made part of the family and given a job to do. Although friendly, this breed is loyal to his family and will protect them from any threat. Regular exercise and training is necessary. 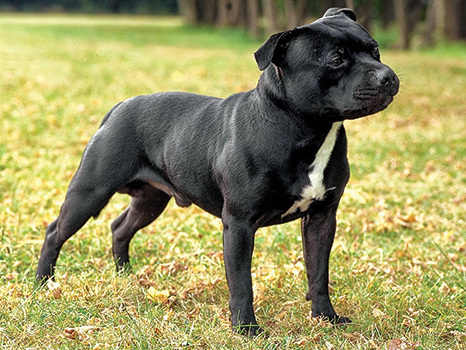 The Staffordshire Bull Terrier, aka the Staffie, is a smooth-coated, active, and agile dog with great strength for his size. This is a courageous, extremely obedient, highly intelligent, and affectionate breed possessing a sense of humor. This, coupled with the breed’s affection for its friends—children in particular—its off-duty quietness, and its trustworthy stability, makes it a foremost all-purpose dog. He looks forward to daily exercise, and his powerful jaws enjoy a supply of sturdy chew toys. While he is a sweet-tempered, affectionate dog, his strength and determination require an experienced owner who can work with him in a firm but gentle way. If your dog dies at home. What to do?